Calum, Cameron, Jennifer and Anna receive the House Shield for Tollaidh. Last year’s Tollaidh prefects Emily, Jake, Jenny and Zy worked hard for their house and encouraged all pupils to make this Tollaidh’s year. 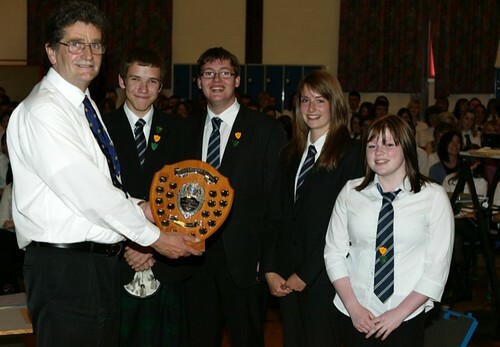 Although Maree won Sport’s Day it wasn’t enough to make up the lead Tollaidh acquired over the year in all the various competitions and events. School continues to be a very busy place right up to the last day of term and beyond. All pupils have started their new classes in preparation for next August and beyond. For S3, S4 and S5 pupils that means new courses, new responsibilities and challenges. We also say farewell daily to those pupils who have come to the end of their secondary career. It is a proud moment for staff, tinged with some sadness as pupils embark on their journey into work or higher education. We wish them all well for the future. S5 were each offered the chance to put themselves forward for the position of prefect. Interviews have taken place and badges have been awarded on the understanding that these pupils set a suitable standard for younger pupils. This is an opportunity for all seniors to shine in areas of responsibility outwith the classroom and we view these positions as opportunities to further develop. Several pupils are invited to take up positions of responsibility based on having previously shown some aptitude and ability to lead. Dux of School – Catriona Leyland – Currently waiting for her Higher results in Religious, Moral and Philosophical Studies, Maths, Biology, English and History. Next session Catriona is studying Advanced Higher Religious, Moral and Philosophical Studies, Advanced Higher English and Advanced Higher History. Salters’ Festival – Dr Caley took four first year pupils to Edinburgh again this month to take part in the Science Festival. Margaret Mathieson, Morven MacRae, Fraser Hinchliff and Callum Vickerstaff performed well in the event which challenges the pupils to demonstrate ability in a series of scientific investigations. Click here for some photos of the trip. Nethy Update – As usual, S1 pupils visited the Aquadome in Inverness as part of their Nethybridge activities but were disappointed that neither the flumes nor the jacuzzi were working, in spite of a prior request. However, the management of Inverness Leisure, have kindly issued all S1 pupils with a free Family Pass to use during the Summer Holidays to make up for their disappointment. Tha sinn airson meall an naidheachd a chur air Aonghas Caimbeul, Eilidh NicAlasdair ‘s Anna Hulme. Bha obair (sgeulachdan goirid no bardachd) a rinn iad air am foillseachadh air a’ mhios seo ann an leabhar air a bheil an t-ainm “Leabhar nan Gaidheal Oga”. Chaidh an obair aca a thaghadh a-mach a iomadh pios-sgriobhaidh agus thainig i mar thoradh air an uine a chuir an sgriobhadair ainmeil Aonghas Padraig Caimbeul seachad comhla riutha san sgoil an-uiridh. Congratulations to Angus Campbell, Eilidh Alexander and Anna Hulme who all had short-stories or poetry published this month in a book entitled “Leabhar nan Gaidheal Oga”. Their work was selected out of many entries and came as a result of the visit to the school last year by the famous writer Angus Peter Campbell. Silver and Bronze DofE expedition assessments – Six pupils were successfully assessed at Silver level two weeks ago during a trip through the Cairngorms. This is the second group this year and it is a credit to all the staff involved that these expeditions take place after suitable training of the pupils. The group were complimented by the assesor as being a credit to themselves, their school and the Award scheme after tackiling a route normally reserved for Gold. There are some photos of the expedition here. An even larger number of Bronze candidates were assessed earlier this week during a two day expedition in the Dundonnell area. Well done to all! Click here for Bronze Expedition photos. Mr D Richardson has effectively retired and many in the community have taken the opportunity to thank him personally for the contribution he has made over a large number of years in the education of all the children of the Gairloch area. Staff and pupils thanked him with a presentation at prizegiving but it is true to say that we can’t really properly show how much we will miss him. We wish him good health and best wishes for the future. Dr Caley is on her way to Malawi and we wish her a safe trip. Read her blog here. Miss Begg has left us and we continue to look for a replacement in Home Economics. Over the summer Miss Morrison will be married to Mr Bryan Whall and we wish them both the best for their new life together. We would also all wish Mrs Sheona MacDonald and her family strength and support at this time as she undergoes treatment for serious illness. Mrs MacDonald will remain uppermost in our thoughts and prayers over the summer. Please also support the Parent Council fund-raising Tombola stall at the Highland Gathering on Saturday 28th June. Day 3 started with signs of some fresh snow on the cliffs below the summit of Braeriach – Scotland’s third highest summit. Much of the snow visible in the photo is old snow left over from Easter. 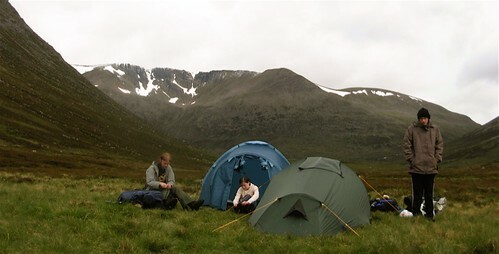 Last weekend a group of six senior pupils completed a Silver assessment in the Cairngorms. Leaving from Glenmore they walked up Strath Nethy and down to Fords of A’an where they camped on the first night. On Day 2 they walked south to Derry Lodge and then west to Luibeg and round to Corrour Bothy. After camping north of the bothy in the Lairig Ghru they completed their walk by crossing the Lairig Ghru and returning to Rothiemurchus through the forest. The assessor from the Expedition Panel was generous in her praise of their achievement. Several of the pupils are already planning to work on Gold. Click on the photo for a slideshow of the trip and here for the gallery. Exam Invigilation – We would like to thank each of our invigilators for their continued support in supervising the SQA exams over the last month. Particular mention must go to Carol Bulmer, our new Chief Invigilator. On behalf of all our senior pupils, we would also like to thank the Hall Committee, and all Clubs and Societies that have been disrupted by this very important event in the life of our senior pupils. Smart Cards – The canteen continues to have a problem with damaged cards. Canteen staff are now required to refuse damaged cards to avoid damage to the machines. A replacement card will have to be bought by pupils. We ask that parents and carers ask their children to look after these cards; they cost the Council more to replace than they charge so we all end up paying for this carelessness. Paying into Smart Cards – The limit that any pupil may have on their account is £40. Cheques should be written to a maximum of £35 so that money can be added without exceeding the limit. S1 Enterprise Day – On Wednesday 21st May, all S1 pupils spent the day preparing ‘Welcome Packs’ for incoming P7 pupils. Working with Mrs Gulliver, Mrs Smith and Dr Caley, they designed booklets giving a “pupil’s-eye” view of the school and made bookmarks for each new pupil. These will be bagged up, together with a highlighter pen and the School Planner, and given to new pupils at the beginning of the term in August. This activity has been running in the school for several years now and pupils do remember what they were given when they arrived in the school. During the day, pupils learn about teamwork and co-operation. They practise skills they have learned in school to produce a quality product, and they also have fun. A perceptive comment on a feedback form this year said that they also learned that Enterprise doesn’t have to be about money. S3 trip to Edinburgh – Fourteen pupils in third year Modern Studies and Geography enjoyed a combined school trip to Edinburgh on the 21st and 22nd of May with Miss Dean and Ms Velt. The Geography pupils conducted a field study and also produced a video of an urban area, while the Modern Studies pupils visited the Scottish Parliament to meet up with our local MSP, Jamie McGrigor and attended the debating chamber when Parliament was in session. The trip also included a visit to ‘Our Dynamic Earth’ museum and the ‘Museum on the Mount’. Click here for photos. The pupils energy and behaviour made the trip enjoyable for all and very successful as a result. A big thank you to Colin the janitor who drove us to Inverness early on the Wednesday and back late on the Thursday. 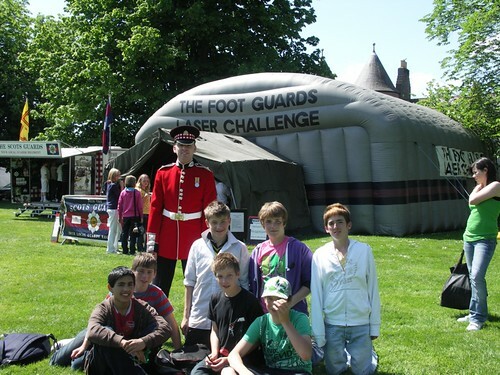 Army Exhibition Day – S2 pupils had an excellent day at Cameron Barracks in Inverness recently, with plenty of opportunities to ‘have a go’ at lots of activities. Click here for photos. S4 Challenge Week – After completing Standard Grade exams all S4 pupils had the opportunity to try some new and challenging activities. Drama skills including Shakespeare, climbing on the indoor wall, preparation for the school charity fashion show to be held in September, cookery, teamwork and construction skills aka building sandcastles, preparation and support for a primary school cross country event, boxercise, photography skills and map reading skills in Flowerdale. All activities were arranged and supervised by staff. P7 Expressive Arts Day – For the first time this year it was decided that all the P7 pupils from the surrounding Primary Schools would come into Gairloch High School for an Expressive Arts Day. They duly arrived Thursday 29th May, wearing PE kit, as instructed, and bringing with them black clothes – even socks! None of them knew quite what to expect, but they soon found out! They were divided into two different clans, ‘Glòir’ (Glory) and ‘Gràs’ (Grace). During the morning, half the P7s went to the Art room and worked with Ms Gulliver, making authentic looking shields, decorated with Celtic designs and coloured with metallic paint. The others went to the PE Hall and worked with Ms. Hunter and Ms. Johnston, learning two different Gaelic songs to accompany dance and movement routines. Later, the two groups swapped over. After lunch everyone worked hard in rehearsals before putting on a performance for staff and High School pupils. The slow, dance of friendship was followed by a mock battle, with much stamping of feet and wielding of shields. All the pupils did tremendously well and, by all accounts, went home exhausted – as did the staff! Bulbs – The school will be offering bulbs again for sale in August with delivery at the end of September. Over the years, these sales have made a good contribution to our school funds and we hope that they will be repeated this year to help us continue to run activities that require that little extra money. Look out for the brochure that will be distributed early in the next session and, if you don’t receive one, they can be obtained from the school office. “Our” School in Malawi – Mlozi Primary School in Dedza district, Malawi is the school that Dr Caley will be going to during the summer holidays. There are 830 pupils in the school with 8 teachers, a fairly typical ratio for rural schools in Malawi. There are 8 classes, Standards 1-8, but pupil numbers are not evenly distributed between them, with 241 pupils in Standard 1, but only 36 pupils in Standard 8. The age range of pupils is around 6 to 17. The Headteacher of the school is Mr Winex Chimtau and the Depute is Mrs Ajawa. Of the remaining staff, four are trained teachers and two are described as “volunteer” teachers. Volunteer teachers in Malawi have completed secondary education but have not had any formal teacher training, and are supported by the local community to counter the shortage of trained teachers. The village of Mlozi is described as quite small and with little infrastructure. It is quite remote from Dedza town, even by Malawian standards, but it does have a borehole, health dispensary and a few shops as well as the school. Dr Caley has set up a website which will contain reports and photos describing her involvement with Malawi. Uniform and Attendance –Can we remind all parents to support us in upholding uniform standards and informing the school promptly if pupils are expected to be absent on a particular day. Dr Caley’s annual trip to Edinburgh took place with four successful S1 science pupils. The pupils competed against other schools in a set of science related tasks. 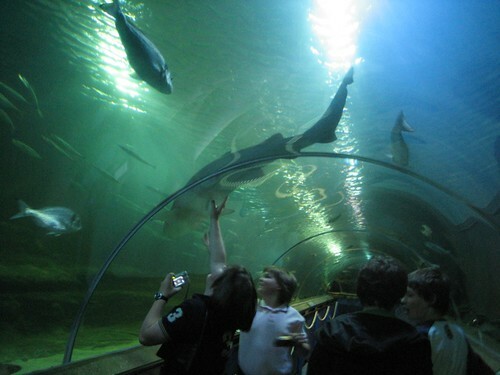 As well as taking part in the festival they also visited Deep Sea World. Click on the photo above to see more photos. S2 pupils visited an Army Careers event in Inverness and took part in a day of activities based around various trades and professions. All the pupils reported having a grand day out.